Kindergarten students learned about the life of Henri Mattise by reading the book, Drawing with Scissors and looking at examples of his cut paper collages. Students specifically looked at his work "Polynesia" and found the geometric and organic shapes within the artwork. Using a piece of 12x18" and 9x12"construction paper (of different colors), students folded and cut the smaller piece into four rectangles. Then, they learned how to make a checker pattern and glued it down using Elmer's glue. Finally, students were given a sheet of white 12x18" construction paper, and folded it and cut out an organic shape border. 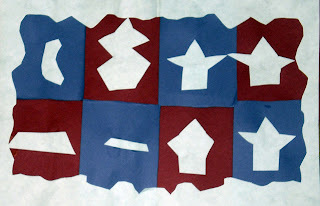 After that, students used the remainder of the paper to cut out at least 8 organic shapes to put in the checker boxes.